PARIS - 2015 marks the first year global temperatures have risen 1 degree Celsius higher than the historical average. It might also mark the first year the governments of the world sign a meaningful agreement to limit their carbon emissions - a first positive step to take us off our current track towards inevitable catastrophic climate change in our lifetime. Some 22,000 government officials are arriving in Paris this week to negotiate the final details of a global agreement. More than that number of environmentalists, activities and other civil society groups are also attending to push the negotiators for the best deal possible. According to a recent article in Wired Magazine, the conference will produce an extra 300,000 tons of carbon emissions - mostly due to air travel. This points not to hypocrisy, but to an inherent paradox in humanity's attempts to grapple with climate change: We know we have to drastically reduce our carbon emissions. Yet we act as if we can do it by making minor cutbacks in our way of life. 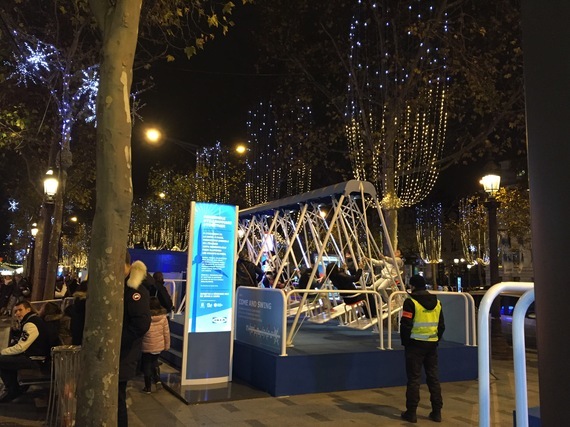 For example, in Paris this year the massive Christmas light display that bedazzles 200 trees along the Champs Elysées also features a windmill and several family-friendly energy generators - swings, stationary bikes and human-sized hamster wheels that passersby can jump onto and help power the lights. Ikea, the sponsor of the display, proudly announces that its goal is to make the Christmas lights 100% powered by renewable energy this year. Isn't it fun being green? It's great that a company like Ikea can make shoppers feel they are part of a greener Christmas. However for the past decade the city has already used low energy bulbs and built a special solar farm to make over 90% of the energy powering lights come from renewables anyway (report). So the net result of the new display is more about feeling good about yourself while shopping for gifts - many of them factory produced and shipped here from China and beyond. The danger is we will feel good about ourselves for running a few moments in a hamster wheel while living our carbon intensive lives. One magnificently subversive "Brandalism" campaign is pointing out the paradox to citizens and visitors to Paris (see BBC news report). The brand-vandals have put up over 600 artworks that look like advertising posters on ad-spaces throughout the city to highlight the links between "advertising, consumerism fossil fuel dependency and climate change," according to Brandalism's press release and. The campaign parodies prominent corporate sponsors of the climate talks such as AirFrance, GDF Suez (Engie) and Dow Chemicals, as well as heads of state such as Francois Hollande, David Cameron, Barack Obama, Angela Merkel and Shinzo Abi also feature. "By sponsoring the climate talks, major polluters such as Air France and GDF-Suez-Engie can promote themselves as part of the solution - when actually they are part of the problem," said Joe Elan from Brandalism in the release. "We are taking their spaces back because we want to challenge the role advertising plays in promoting unsustainable consumerism. 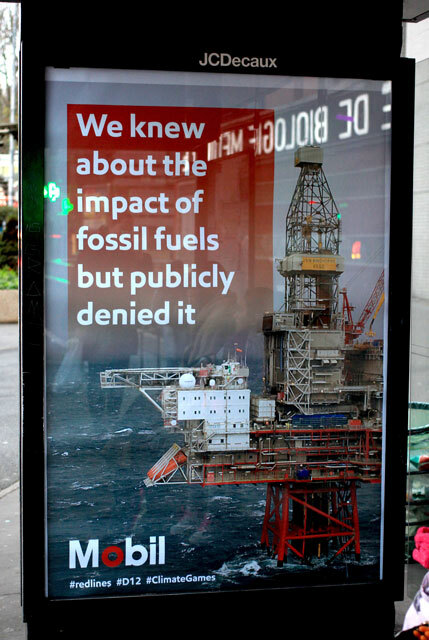 Because the advertising industry force feeds our desires for products created from fossil fuels, they are intimately connected to causing climate change." This is the real challenge we face: Are each of us ready to shop less, travel less, and eat less meat? I hope we all think about this as the world focuses on Paris in the coming two weeks.